Seventy percent of the grass-roots groups said they have not participated in any political campaigning this year. As a whole, they have no official candidate slates, have not rallied behind any particular national leader, have little money on hand, and remain ambivalent about their goals and the political process in general. ….The findings suggest that the breadth of the tea party may be inflated. The Atlanta-based Tea Party Patriots, for example, says it has a listing of more than 2,300 local groups, but The Post was unable to identify anywhere near that many, despite help from the organization and independent research. ….In all, The Post identified more than 1,400 possible groups and was able to verify and reach 647 of them. Each answered a lengthy questionnaire about their beliefs, members and goals. The Post tried calling the others as many as six times. It is unclear whether they are just hard to reach or don’t exist. In other words, the grassroots tea party movement (lower case) is a lot less important than most people think. 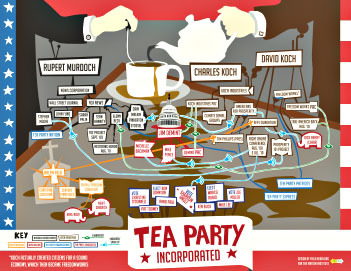 Conversely, Tea Party Inc. (upper case) is considerably more important than it’s usually given credit for. Adele Stan has more on that. Eleven percent said that Obama’s race, religion or ethnic background was either a “very important” or “somewhat important” factor in the support their group has received. In the past I’ve argued that although racial tensions were obviously a motivating factor in the tea party movement, conspicuous racism itself wasn’t a big part. But this makes me wonder. The taboos against admitting that race makes a difference are pretty strong, and if 11% of the tea party groups were willing to admit this in writing, it suggests that probably at least a quarter of them have similarly overt views. Maybe more. That’s a helluva lot.